So I think I may switch to doing this hat, which requires a specific cast on. I went to look at the cast on required, and, just, no. Like many people who sew (time was, I made Renaissance costumes in my spare time…. ), I hate sewing up little things…. And that includes seams on knitting. For the chemo turbans, you’re supposed to knit a 40 inch long strip, then seam together the top 8 inches, after grafting the ends together. (Look at the pattern, linked below – it makes sense, really!). Someone on ravelry suggested doing Judy’s Magic Cast On to avoid this 8 inch seam. Take your working needle. 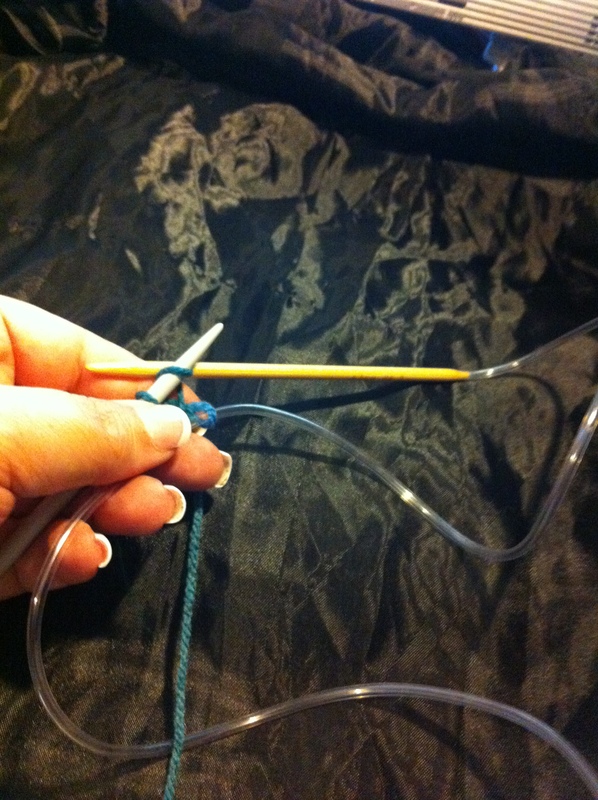 For this, the working needle (wn) needs to be a long, circular needle. You aren’t going to knit in the round, but you are going to need the cable. Hold it with the point of one end going away from your dominant hand – for me, that means holding it in my right hand, pointing to the left. Place another circular needle (acn) underneath the first, pointing the same way, level with the first one. Make a slip knot in the wool. The working wool – none of this waste yarn for you, you want to get right to work! 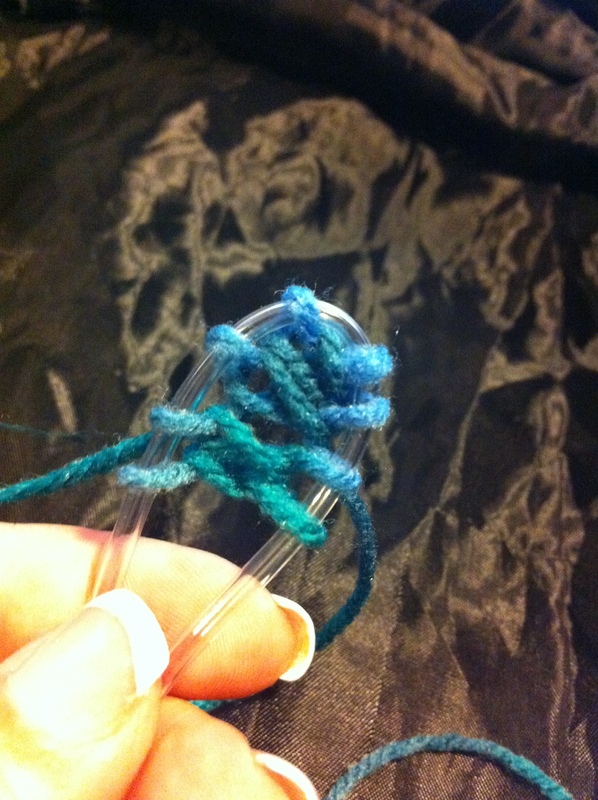 Slip the knot on the working needle, which is on top of the other needle. Each wrap is one stitch – even the ones on the bottom. 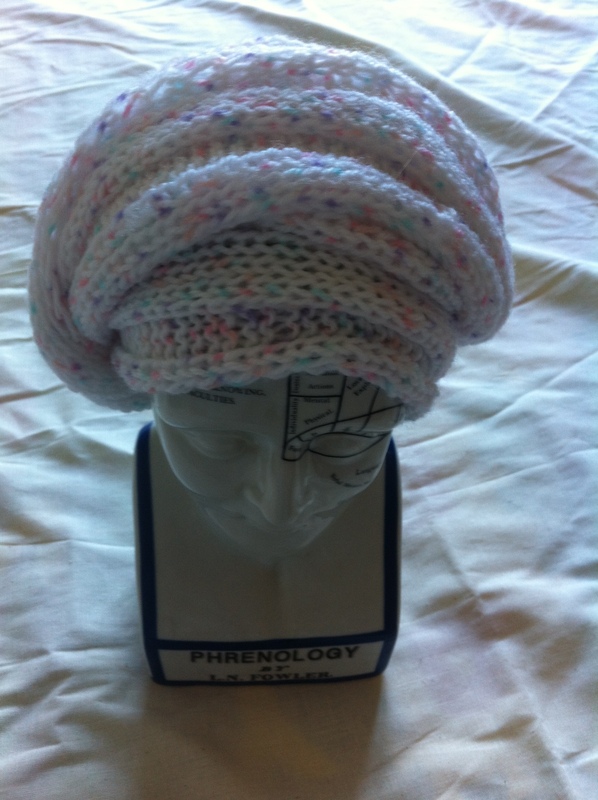 So, for the chemo turban, you want 50 stitches a side – so 100 stitches IN ALL. So, 50 wraps on the top and fifty on the bottom. When you get that number, breathe a nice sigh, you’re mostly there. 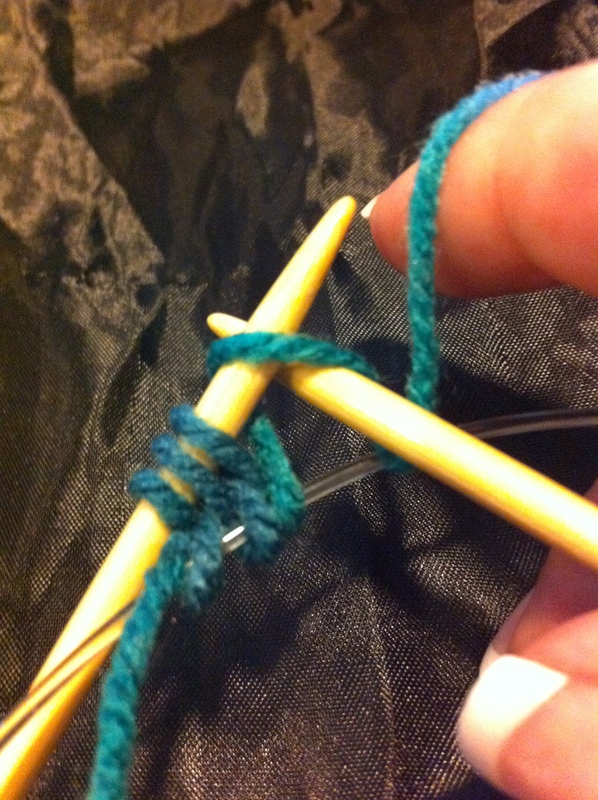 Slide the second, nonworking, bottom needle *forward* – that is, away from your dominant hand, so that the stitches glide nicely onto the cable. That’s why you needed two circulars. Just let it flop. (It won’t really flop because it’s held with the stitches, but get the needle bit of it out of your way). Turn the whole kaboodle around, so that the last wrapped stitch is now facing you, on the working needle, just as if you’d just cast it on in a regular way. 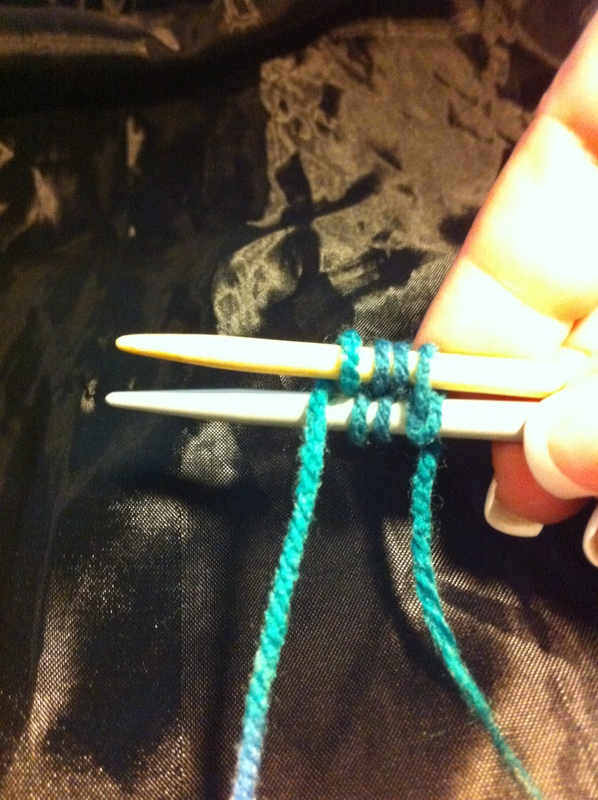 (You need to make the last wrap go around the other needle – you’ll see why as soon as you look at the work). Grab the other end of the working needle, and knit away on the stitches….When you get to the point of needing to knit the stitches on the second needle, THAT’S when the cable comes into its own. Work as for magic loop, from here on in. (In other words, you’ve got a corner in the work that won’t knit in a straight line – not for a goodly number of rows. Knit up to that point, puuuullllll the cable out till you have slack in it, and carry on knitting – this will allow you to reposition the needle so you can work going around the corner. Be sure to pull the yarn tight, and you’ll be fine). When you’ve knit the row, and pushed it all on to the cable, it looks like this… Unpreposessing, I agree – but just keep going, it will be fine. Knit back and forth – NOT in the round! When you’ve knit about 8 inches, put half the stitches on a holder, knit on the first half for about 24 inches, and graft the end together with the stitches on a holder (don’t twist!). 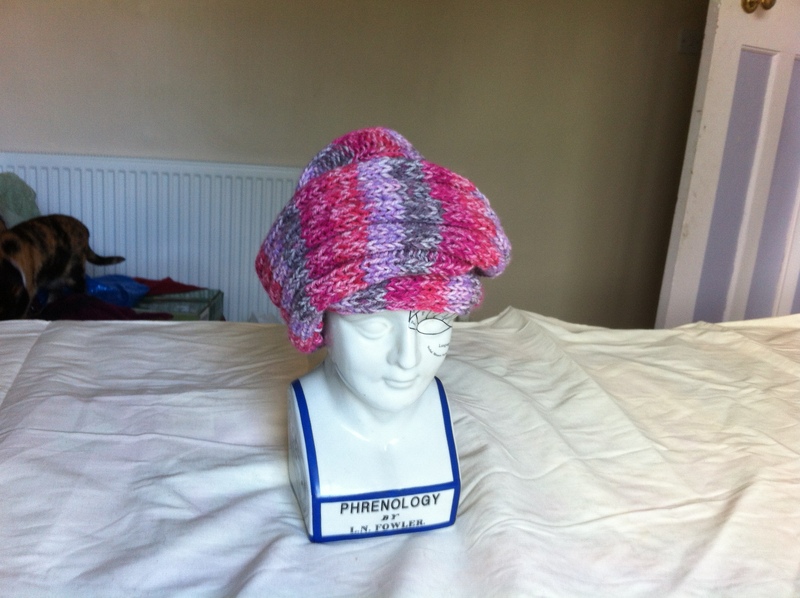 I’ve made a Just Giving page for the making-of-the-chemo-cloches: it’s here. The virtue of the thing is that no money comes to me at all – it all goes directly to the charity, and (if you are are UK tax payer) you can sort it so the charity gets the gift-aid, as well. I’ll update the page with pictures of the cloches as I go! MILESTONE: The challenge has raised £50 as of 16.8.12! Thank you! In September, I will have a very, very great deal of marking to do. 17 MA dissertations, to be exact – of 20k words each. As I may have said before, when I mark things, or read on-screen, I do simple knitting because it helps my concentration. It needs to be something simple, because the whole idea is to *increase* my concentration on the reading, rather than decrease it. A few years ago, I did a challenge when I tried to fill a rather large box with charity knits, working from the longest to the shortest day – and then donated the products. 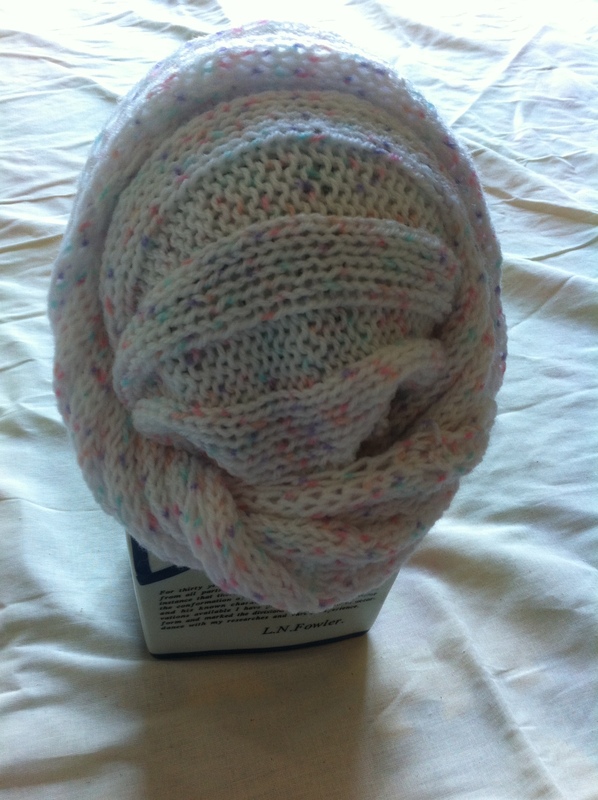 This time, I’ve decided to knit chemo turbans. They are very, very clever, (and the pattern is here) – just long strips of knitting, that one then seams and twists. I’ve made one, to see if it would work for what I want, and am in the process of making a second one. I think they take about 6 – 8 hours to make. And I think they look rather good, don’t you? I may even ask people to sponsor me (if I can set up a just giving page or something so that the money goes straight to the charity) or to donate to their favourite charity for each one I make.